Sweet Susanna Hill has a new contest for us! The Contest: Write a Valentines story appropriate for children (children here defined as ages 12 and under) maximum 214 words in which someone is grumpy! Your story can be poetry or prose, sweet, funny, surprising or anything in between, but it will only count for the contest if it includes someone grumpy (can be the main character but doesn’t have to be) and is 214 words max (get it? 2/14 for Valentines Day) You can go under the word count but not over! Title is not included in the word count. No illustration notes please! Here's my entry coming in at exactly 214 words. Happy Valentine's Day! Billy Goat, Baby Goat, and Mama Goat have valentines to deliver in the sweet green valley, but a hungry troll guards the bridge. “I have an idea,” Baby Goat says. The goats huddle to hear the plan. Baby Goat scrambles up the bridge. “Don’t eat me! 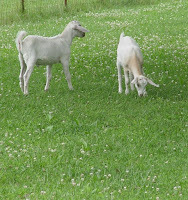 My meatier brother is coming soon.” Baby Goat skips to the valley. Billy Goat hoofs up the bridge. “Don’t eat me! 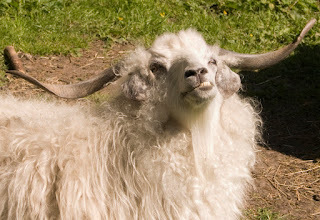 My sweet mama is coming soon.” Billy Goat gallops over the bridge. Mama Goat climbs the bridge. “Hi, I have a valentine for you,” Mama Goat says with a wink. “Would you like to deliver valentines with me, Mr. Troll?” Mama Goat asks. “Of course!” Mama squeals. “Happy Valentine’s Day!” She click-clacks down the bridge. Thanks other Lauri - and so excited about your book launch! Kudos to Mama goat for knowing the value of a sparkly pair of shoes!! Hi Tracy my long lost writing buddy! Kisses! Nice Valentine twist on the # Billy Goats Gruff. Good Luck, Lauri. Great story! And YAY! GOATS! Fun story, Lauri, and I love the ending! I've missed your stories/blog! Great last line, "I could eat her right up!" Brought a smile to my face. I love the humorous twist at the end. Fun! Why do I have the feeling that Mama goat better watch it on the way back?! :) Love your Valentiny twist on the 3 Billy Goats, Lauri! Thanks so much for joining in the fun!